As soon as I watched in the television someone making fish and vegetable skewers a few days ago, I knew I would be doing it too. And this is the day. I was aware that I was actually a season late, being a perfect summer plate. But then the skewers I watched were cooked on a saucepan. My griddle would work well. The fish rolls are stuffed with breadcrumbs, parsley & capers. I chose to use sword fish this time instead of sole even if the latter would work very well in this recipe. My parsley plants never recuperated from too much snipping the past months. It's a perennial so they should still spew out some leaves later on. I'm crossing my fingers that they survive the cold season. The basil, however is an annual, so my plants are taking out the last leaves before they die down. That herb epitomizes summer. The scent & taste exudes sunshine and freshness. They are slowly pulling back along with the season they came with. Which reminds me. I should start freezing them! They are so scarce in winter. Summer fruit slices and a sauce of extra virgin olive oil, lemon, salt & herbs for grilled food that I recently learned in Sicily. What I learned was that you don't cook the vegetables too long, cooking them at same time as you cook the fish, leaving them crunchy and I think I prefer them that way. 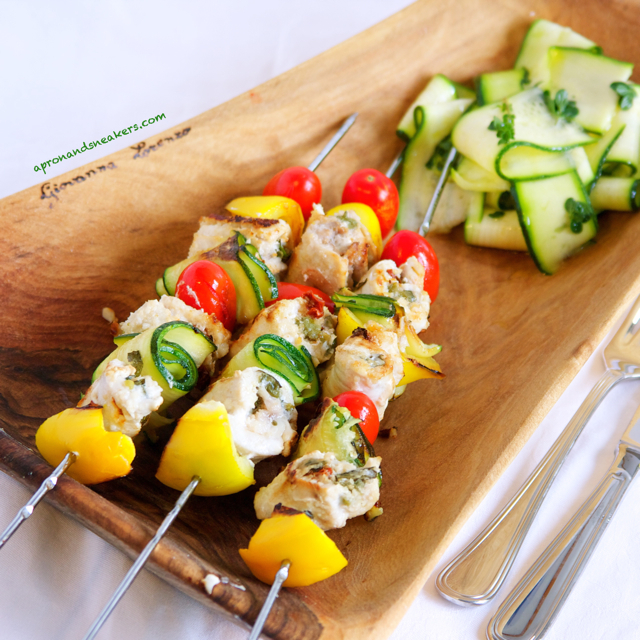 I loved the ingredients in the skewers, especially the zucchini, cooked and raw. And leaving the fish for last, they were divine. Absolutely. Really. My husband graded it dieci e lode (top marks). A few days ago, we decided to have our last outdoor summer barbecue. We were able to time it perfectly right before the temperature started dropping. 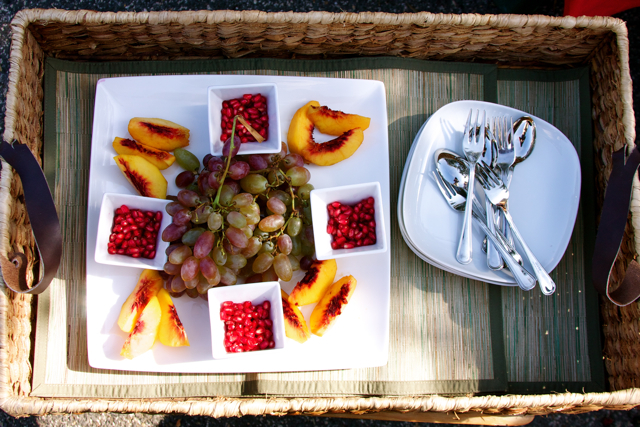 Grilled meat & vegetables, bruschette, fresh fruit, cold drinks..... all eaten under the olive trees. We will have to wait for a few months until we set the table in that spot again. We are packing up. Party time is over. I am plodding through a grueling work of season-changing in the closets this week. Our chilled bodies are calling out for longer & thicker clothes. The shorts, sandals & tank tops are going, to be replaced by sweaters & pants. Beiges & whites will be tucked away while the blacks & grays come out again. And I will leave you this post as a last salute to summer. After we have imbibed the beauty and warmth of this season, let's move on to the next step. I'm ready for autumn. 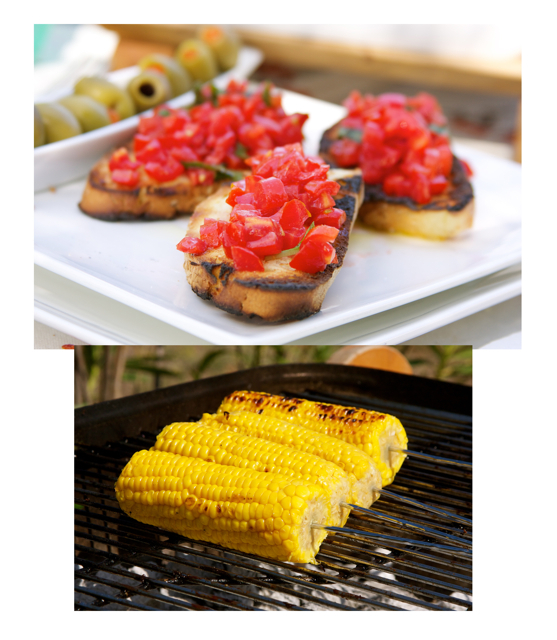 What is grilling without some tomato bruschette & corn? Cut off both ends of the zucchini. Discard. Slice thinly with a vegetable slicer. Put them in a bowl. Mix with salt, thyme & extra virgin olive oil. Mix gently with your hands until all the slices are completely covered with the condiments. Prepare about 16 rolls. Get 2 thin slices of zucchini. Roll together. Set aside. Rinse the capers under the tap. Squeeze lightly while doing this. Take away excess water with a kitchen paper towel. Chop the sun-dried tomatoes & capers together. Set aside. Make sure your fish fillet are sliced thinly & about 8 cm. (3 in.) wide. The length should just be enough to close the roll, about 12 cm. (5 in.). Lay the fish flat on a plate. Sprinkle with a bit of salt & pepper. Sprinkle a generous amount of breadcrumbs. Distribute the chopped capers & sundried tomatoes. Put one basil leaf. Roll. Repeat until you finish all the fish. Allot 3 rolls per skewer. 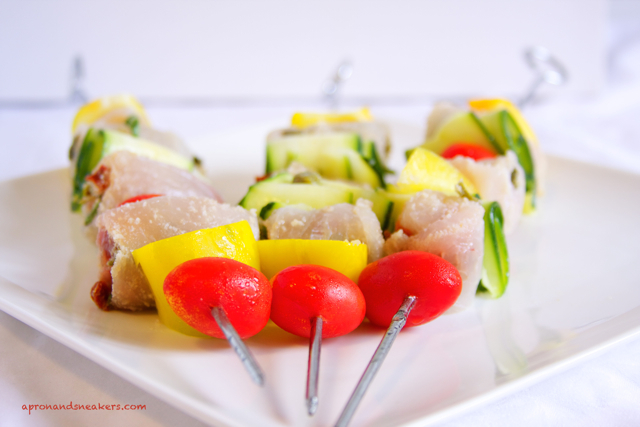 Prepare the skewers. Put the vegetables & fish in any order. 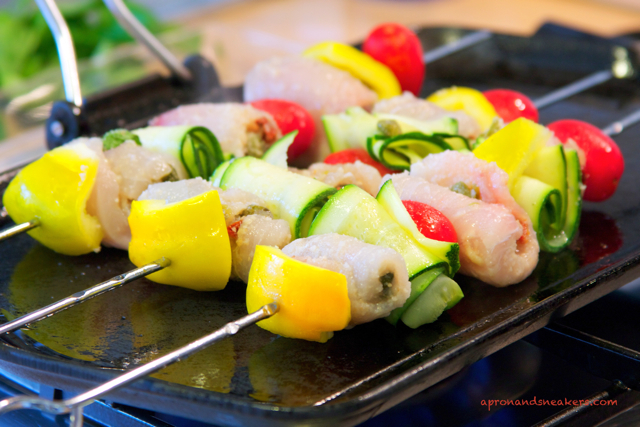 Warm up a stove-top griddle or thick bottomed non-stick pan. Drizzle some oil and wipe off excess with a kitchen paper towel. Sprinkle salt on the griddle. 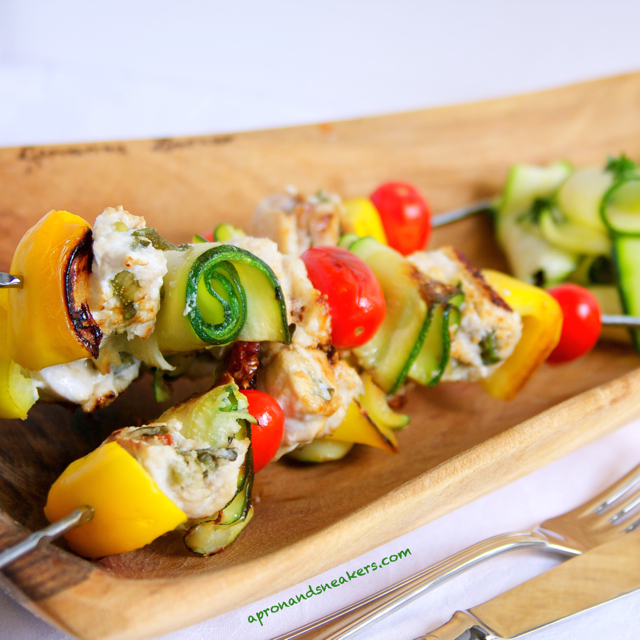 When it's warm, put the skewers. Cook both sides. Fish should get a beautiful golden color while the vegetables can retain a slightly crunchy consistency. Drizzle with extra virgin olive oil before serving. 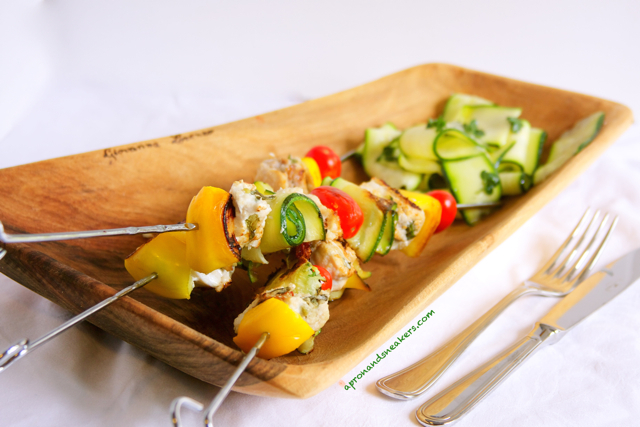 Serve warm with the fresh zucchini salad that remained.